Bush fires occur naturally in our Australian environment. Many people fail to properly prepare for them even though they take place regularly. You need to prepare well in advance of a bush fire threat. If you leave your critical decision making too late you may have very few safe options left. You will need to make some very important decisions before the bush fire season begins. You should begin by going through your Bush Fire Survival Plan. This will be one of the best ways you can improve the safety of both yourself and your family before you come in contact with a bush fire. Preparation is very important. It involves more than just having a plan and cleaning up around your house. It is about making sure you have considered your physical, your mental and your emotional preparedness. You must make sure that you have prepared yourself and your family for bush fires. Regardless of your decision to either leave your property early or to stay and defend it, you need to make steps to prepare your property against the threat of a bush fire. The higher the fire danger rating is the more dangerous the conditions become. 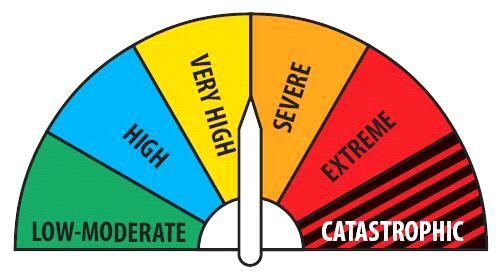 Part of knowing what to do when there is a bush fire threat is knowing what the official Bush Fire Danger Ratings are. The official Fire Danger Ratings should be the first trigger that activates your Bush Fire Survival Plan. The safety of you, your family and your home will depend on this. During these periods of increased fire danger as well as when there is a bush fire in your area, it is important that you always stay up to date with the bush fire danger ratings.The fire danger ratings information can be found in a variety of places. For more details on what types of information is available visit the page: Information during bush fires. Fires can threaten without any warning so you will need to know what to do in order to survive. During a fire you need to follow your Bush Fire Survival Plan. That means you should have already decided if you are going to Leave Early or Stay and Defend your home. The safest option for you and your family during a bush fire threat is to leave early. Sometimes things don’t always go to plan. Because of this you will need a back up plan. Neighbourhood Safer Places have been introduced for this reason. You should check if there is a Neighbourhood Safer Place near you and make this a part of your Bush Fire Survival Plan. During a bush fire it’s important you have ready access to the items which may save your life. Find out what you should put in your Emergency Survival Kit. The extreme heat from a bush fire can kill you. That’s why it’s important that you wear clothing that will protect you from the heat as well as from smoke and embers. To have the best chance of survival you should Know what to wear during a fire. During periods of increased fire danger or once a fire starts you will need to stay up to date. Know where you will get information during a fire. You need to take steps to prepare yourself, your family and your home. This means being prepared well before you can be affected by a fire. Following your Bush Fire Survival Plan will be one of the best ways to help you improve the safety of both you and your family before the bush fire reaches your area and during it. Your plan can help to stop you from making dangerous and rushed decisions at the last moment. 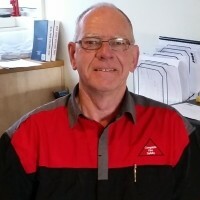 The Rural Fire Services encourage you to complete your plan with your family, so that everyone will know what they have to do if a fire does start. You should always keep your Bush Fire Survival Plan in a safe place where it can be seen by everyone. No matter how well prepared you are there is always the risk that things won’t go as planned. That is why you will need a back-up plan, whether you plan to Leave your home Early or Stay and Defend it. Your Survival Plan will help you with this. Preparation is more than just cleaning up around the house and having a plan in place. It is also about making sure you carefully consider your mental, physical and your emotional preparedness. A bush fire can be a terrifying situation. Flames, intense heat and strong gusty winds can make you tired quickly. The thick and heavy smoke will sting your eyes and make your lungs choke. It will be difficult for you to see and breathe. You will be deafened by the roaring sound of the approaching fire. Embers will rain down around you causing spot fires. Your power and water may be cut off. You may also be isolated. It will be extremely physically and mentally demanding. At night you will be left in the dark with only the noisee of the bush fire. You should plan to Leave Early if you have any doubts about your ability to cope with the situations to come. Having an Emergency Survival Kit is a major part of preparing yourself. The emergency survival kit will include items which can help you to survive a bush fire. You should also know what to wear during a bush fire. The right personal protective clothing will help protect you from extreme heat, smoke and embers. Whether you decide to Leave Early or Stay and Defend, you will still need to fully prepare your property against the threat of a bush fire. 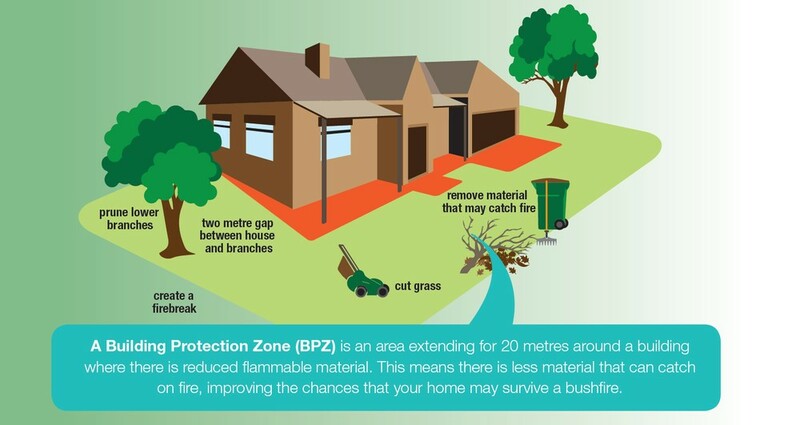 A well prepared home is more likely to survive a bush fire. Even if your plan is to leave your property early, the more that you prepare your home, the more likely it is to survive a bush fire or ember attack. A well prepared home has more chance of surviving a bush fire. A well prepared home can be defended easier by you and firefighters. A well prepared home is less likely to put your neighbours’ home and property at risk. A well prepared home will offer you more protection when a fire threatens suddenly and means you cannot leave and have to take shelter. Maintain suitable levels of home and contents insurance. 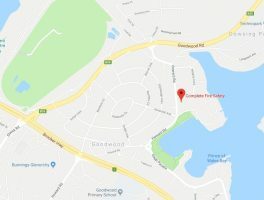 Many houses are destroyed in a bush fire due to ember attack. This happens when burning leaves and twigs land on or around the house. Even houses well away from the direct path of the bush fire can be seriously affected. Look around your house for all the places embers could start fires. Look on the roof, under the floor and around windows and doors – and take the appropriate action required to prevent them. Fire Danger Ratings are there to give you an indication of the consequences that a fire would have if a fire was to start. The ratings are based on predicted conditions such as the temperature that’s forecast, the humidity, wind and the dryness of the landscape. It can tell you how a bush fire may act and what impacts there might be on the community if a bush fire started. It will also tell you when to implement your Bush Fire Survival Plan. The higher the fire danger rating, the more dangerous the conditions and consequences. You must keep informed and be ready to act. The higher the Fire Danger Rating the more severe the consequences could be for you and your family. As the fire danger rating increases the likelihood that people will die or be injured, if a fire was to start, also increases. On days that are classed as Catastrophic, no properties that are in areas where a bush fire can start will be defendable. Some fires can burn so intensely that not even the specially designed and constructed fire safe homes will be safe. Fire danger ratings of Severe, Extreme and Catastrophic mean that a fire will be unpredictable, uncontrollable and very fast moving. This means that you may have little to no warning about the bush fire threat. You need to make sure you keep yourself fully informed and ready to put your bush fire survival plan into action. It is important that you stay up to date with information when there is increased fire danger or when there is a bush fire in your area. Knowing the Fire Danger Rating for your area, especially for days that are hot, dry and windy. Look and listen for information on TV, radio, internet, your mobile phone and by speaking with family, friends and neighbours. If you receive a Bush Fire Alert you must take it seriously and act as quickly as you can. Watch for signs of fire. Can you see or smell smoke? Never rely on a single source of emergency information. NOTE – some fires can start and spread so quickly that there is no time for any warning. That is why you need to have your Bushfire Survival Plan ready. Download the TFS bushfire survival plan here. Controlled burns or hazard reductions are an important part of managing bush fire risks. You can find information on scheduled controlled burning or hazard reductions on the TFS Web Site. During a bush fire emergency, you may receive an emergency warning on your telephone. The Emergency Alert system is a nation wide system that will deliver a voice message warning via your landline or via text message to mobile telephones. You do not need to register. Messages are sent to landline telephones based on the location of the handset. Messages are sent to mobile telephones based on the service address of the mobile phone. 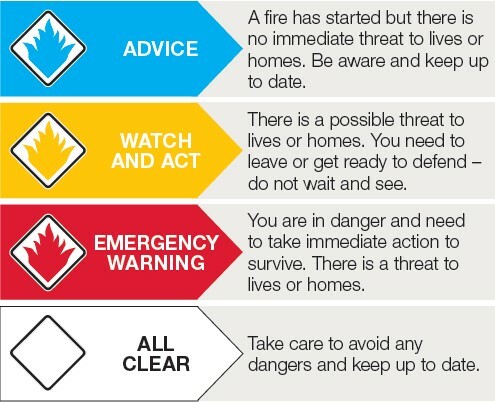 Alert Levels are used during a bush fire to give you an indication of the level of threat from a fire. You can find the Alert Levels on the NSW Current Incidents page or on the television and radio. There are three levels of Bush Fire Alerts. For some fires, you may hear a warning message, such as a siren, on your television or radio. You may also receive an Emergency Alert text message or a phone call. Other fires can begin so fast that there is no time for any warnings at all. You must take any Bush Fire Alert seriously. Failure to take action can result in the death or injury of your family members or even yourself. The survival of you and your family must be your highest priority during a bush fire. Buildings and other material items can be replaced. People’s lives cannot. When a fire first starts you must put your Bush Fire Survival Plan into action. You must not hesitate at all. What you need to do depends on a number of different factors like your personal circumstances, who is with you at home and whether your plan is to Leave Early or Stay And Defend. To Leave Early before a bush fire is always the safest option.You will have to decide what your trigger will be to signal your time to leave. You need to decide your own triggers. These will depend on your own situation. 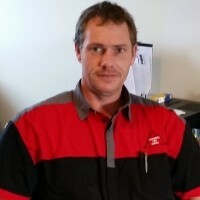 Triggers can be a range of things such as a particular Fire Danger Rating of Catastrophic or Extreme, or if there is a fire in a certain range of your home. Your trigger must be something that happens long before a fire threatens your safety. When you leave, you need to make sure the place you’re going is safer. You might want to go to one of your friends or a relative’s house or a shopping centre that is away from any bushland and won’t be affected by a bush fire. Before you go you should contain your animals in a fenced-in area that is well cleared. You should never turn your animals out on the road to run free. This can create a dangerous situation for them as well as for firefighters and other people on the road. Before you decide to Stay and Defend your home you should ask yourself if you are capable and fully prepared. If you are not, you should leave early.Before the fire has any impact you will need to actively defend your property. Ensure you drink plenty of water to stop you from dehydrating. Block all of your downpipes and fill all of your gutters with water. A sock full of sand or soil can help to do this. Move any flammable items like doormats, outdoor furniture or hanging baskets away from the house. You should face the valve of any gas cylinders away from the house. Do not stand on the roof of your house with a hose. During bush fires more people are injured by falling off roofs than suffering burns. Patrol the outside of your home and put out any spot fires that start or embers that fall nearby. A spark or an ember can reach your home hours before the fire front arrives. Just before the fire arrives you should wet down any timber decks and gardens that are close to the house. Move any firefighting equipment to a place where it will not get damaged or burnt by the fire. Continue to drink water to avoid dehydration. Confine your pets to one room. Close all doors, windows, blinds, vents and curtains to prevent flames, embers and smoke from entering your home. Place tape across the inside of the windows so they will stay in place if they break. Shut off your gas at the meter or the bottle. Move all furniture away from any windows to prevent any embers that enter the house from igniting. Fill your bath, sinks and any buckets with water so you can put out any fires that start inside. Place wet towels around your door and window edges to stop embers and smoke from entering. Place a ladder next to the access hole to the roof space so you can easily check for spot fires in the roof void. When the fire arrives you should go inside your house so that you are protected from the radiant heat. You must ensure you have torches ready as it is likely to become completely dark at night and prevent you from seeing. Shelter in a room that is on the opposite side of the house from the approaching fire. The room should have a clear exit out of the house. Patrol the inside of the home including the roof space for embers and sparks. Remember: If Your Life Is At Risk, call Triple Zero (000) immediately. Once the fire has passed you should still patrol your property for hours. Go outside and put out any parts of your home or garden that are on fire. Check the roof space as well as under the house.A spark or an ember from a fire can still have an impact on your house many hours after the main front of the fire has passed. Small spot fires can quickly get out of control. Scientific research and testing has shown that sheltering inside a vehicle during a bush fire is a high risk strategy. It is highly unlikely that a person will survive in such circumstances. Whilst sheltering inside a vehicle can offer you slightly higher chances of survival than being caught out in the open, having a Leave Early or Stay and Defend Strategy is a much safer option. You should never journey into areas where the fire danger is at the catastrophic or extreme levels. You should consider finding alternative safe routes or postponing your travel if necessary. If you see smoke in the distance or if you can smell smoke in the air it is best to turn around and drive away from the danger. If you are confronted with flames or smoke while you are driving you should STOP as soon as it is safe to do so and immediately turn on the vehicle’s headlights and hazard warning lights. If you do need to take shelter in your vehicle you should drive your car into a clear area that is well away from any surrounding trees. You should leave your headlights and your hazard lights on. Turn off the ignition, close all windows and air vents, then cover yourself with a woollen or a cotton blanket to protect yourself from the radiant heat. You should take shelter below the level of the window. You should frequently drink water and stay in the vehicle until the fire front has passed by. Once the fire front has passed you can exit the vehicle and inspect the damage and ensure the other passengers are safe.